Fine for text and presentations, but not movies. The BenQ CP120c is a smart DLP projector that looks even smaller than it really is, because BenQ packages the projector and the cables in separate cases. It took moments to set up, as the auto keystone function works well, giving an image that is perfectly square. Levelling the projector is simple, as you have a drop-down foot at the front and a threaded adjuster on one of the rear feet. The lens is protected by a sliding cover, which you flick to one side, and access to the focus and zoom controls is provided by an opening in the top of the projector, which is quick and easy to use. Initially, we thought the displayed image was atrocious, as the colours were dark and muddy, forcing us to raise the brightness which made black text on a white background glare uncomfortably. We were using a silver screen, so flipped it round and tried out the white side, which transformed the picture from 'shocking' to 'acceptable', although the colours remained largely unimpressive. 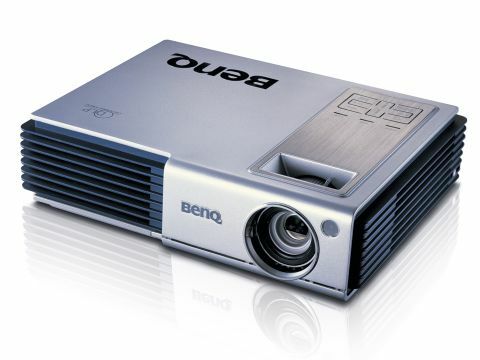 If you're planning on running regular presentations and text documents, then you'll be happy with the BenQ, but we wouldn't recommend you watch too many movies with it at the weekend. It's a funny thing, but the CP120c is so average in almost every respect that once we'd packed it away, we immediately forgot about it, so let's stick to facts and figures as the BenQ has one distinct feature in its favour: the 1024 x 768-pixel resolution at an 800 x 600 price.